The 17 Day Diet was created by Dr. Mike Moreno, a family practice physician in California. After being featured on The Doctors TV show and Dr. Phil it has rapidly become one of the hottest weight loss plans for two years running. The diet involves a series of 17-day cycles with adjustments in the composition of the foods you eat. Moreno suggests that a weight loss of 10-12 pounds is possible in the first 17 days. He cites recent research showing that rapid weight loss does have long and short-term advantages over the slow weight loss approach. Dr. Morano has enhanced his popular 17 Day Diet with some enhanced options that have proven successful for the 1000’s that have completed his program. 3 additional chapters covering supplements, new exercises, and many more success stories. An optional “fast day” to accelerate fat loss using Mike Morano’s liquid cleanse. In basic terms, the 17 Day Diet is a carbohydrate cycling diet whereby you adjust your intake of carbohydrates in accordance with whatever phase of the diet you are in. At certain times, you will follow a very low carbohydrate diet while at other times you can enjoy specific foods that are higher in carbohydrates. According to Dr. Moreno, this has the effect of confusing your metabolism and enhancing the rate at which you are able to lose weight. It also can help to reduce the frustration and boredom that is generally associated with long-term dieting. In this initial phase you dramatically reduce your intake of carbohydrates to promote fat burning, cleansing, and rapid weight loss. This 17 Day Diet phase involves carbohydrate cycling, which has the purpose of resetting your metabolism to stimulate fat burning and prevent plateaus. You reintroduce some previously restricted foods and will learn how to develop healthy eating habits. The final phase allows you to maintain your goal weight by eating a healthy diet during the week and indulging in your favorite foods on the weekends. During all of the four phases of the 17 Day Diet, there is an emphasis on clean eating and the avoidance of sugar and all processed foods. Do I have to drink green tea? Yes, Dr. Moreno believes green tea helps to speed up the metabolism and give the body a boost of antioxidants. Any brand of green tea is fine and it can be hot or cold, but sugar-free. The book promotes the use of Stevia as an all-natural sweetener but doesn’t endorse artificial varieties like Sucralose and Aspartame. I’m diabetic, is the 17 Day Diet for me? Dr. Moreno says that his diet is perfect for Type II Diabetics, but Type I Diabetics should be cautious of using his plan. Always consult your physician before beginning any new diet. Can vegetarians or the gluten intolerant do the diet? Yes, the book has many alternate suggestions for vegetarians as well as those on the gluten-free diet. Can I drink wine while completing the cycles? There are provisions for wine in cycle 3, but Dr. Moreno says that the 17 Day Diet isn’t about depriving you. Wine in cycles 1 or 2 will just slow down your progress, but not ruin the diet. Can I use this diet to get rid of my baby weight? Dr. Moreno says that since the 17 Day Diet isn’t missing nutrients, it’s fine for a woman who are breastfeeding and want to lose the baby weight. He advises mothers to consult with their doctors to be sure it will fit with their particular health histories. Eggs, turkey breast, chicken breast, seafood, yogurt, grapefruit, berries, lettuce, broccoli, Brussels sprouts, tomato, cucumber, asparagus, green tea. The book contains recipes that Moreno claims are quite easy to make, but also suggests taking out a delivered meal plan from Bistro MD — but this can get expensive. The 17 Day Diet also has released a cookbook to assist dieters in preparing meals that fit with the program. 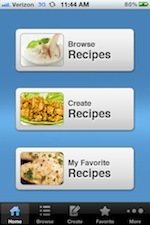 There is a helpful iPhone app available that gives dieters 100, 17 Day Diet recipes at their fingertips. These recipes are formulated to be tasty yet easy to prepare. This is helpful because the app incorporates all of the recommended foods into the recipes while eliminating all of the restricted foods and ingredients. Dr. Moreno is a strong advocate of exercise as a way to ensure fast results. The 17 Day Diet involves a 17-minute exercise routine that should be performed six days a week. An exercise DVD is available of the 17-minute workout program for $15. 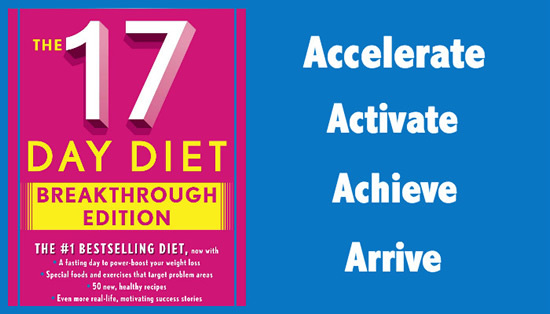 The 17 Day Diet retails for $26, the workbook is additional $16, and the cookbook is $26. Encourages the intake of a variety of unprocessed, natural foods. Carbohydrate and calorie cycling may help to accelerate the rate of weight loss. Variety in the 17 Day Diet structure can help to maintain motivation and prevent boredom. An eating plan is simple to understand. An exercise program is short and effective. Home delivery meals are available for an additional cost. Includes tips for avoiding holiday weight gain. Not suitable for Type I Diabetics. Irregular eating patterns have the potential to trigger disordered eating in susceptible individuals. Does not adequately address the psychological factors required for successful weight loss over the long term. The 17 Day Diet involves adjusting your intake of carbohydrates, fat, protein and calories over a series of 17-day cycles, which may have the effect of boosting metabolism and preventing the plateaus that are common with most diets. Even though the plan was created to help dieters avoid holiday weight gain, The 17 Day Diet can be followed at any time when fast and effective weight loss is desired. However dieters must be aware that permanent changes in eating patterns, lifestyle habits, attitudes and beliefs are essential if weight loss is to be maintained. Nackers, L. M., Ross, K. M., & Perri, M. G. (2010). The association between rate of initial weight loss and long-term success in obesity treatment: does slow and steady win the race?. International journal of behavioral medicine, 17(3), 161-167. It’s very difficult for me to drink 8 glasses of water a day. Can I get coconut water instead of some of the glasses? I cheated badly over the weekend and today did a fast day! Is there any benefit to doing more than one fast day in a row when you’ve been bad like that? no, you’re just risking slowing down your metabolism. WRONG! The metabolism doesn’t slow down for the first 72 hours and after that the slowing down is very slight. I’d recommend you read up about intermittent fasting and fasting overall. I only lost 5 lbs. the first 17 days and am now on day 22 and haven’t lost any more weight. Can I drink coffee on this diet? What about coffee with a small amount of low fat acidophilus milk, no sweetner or maybe a half a packet of Truvia? I lost 12 lbs in the first 14 days of phase 1, then lost only 2 more lbs thru the end of phase 2. I went back to phase 1 (as the book suggested) & am now at day 5 ( 39 days total) on the second round of phase 1. I have even gained upt to 3 lbs in one day on occasion. All of this while being very very strict with the diet plan! My exercise is very limited to to severe lower back/leg pain for which I am being treated with physicial therapy & accupuncture & steroid injections but no narcotics. I am very frustrated at this point. I wonder if anyone else has similiar “plateau” issues or suggestions!? I’m sorry to say that Corticosteroids will decrease you ability to lose weight. In fact, steroids will increase your blood sugar for a while after injections. Not sure how long the side effects of the steroids will last, but I hope your inflammation will be greatly reduced. Don’t give up! I have started the 17 day diet 11 days ago and have lost 12 pounds so far. I am within 30 pounds of my ideal weight so I wasn’t expecting the big loss. My husband started 4 days ago and has lost 6 pounds. It’s all about choices and I choose to be smaller and feel better about myself. The food is really good, lots of variety. I think it really helped to read the book first to get a good understanding of what I was about to do. I have never been more pleased with a plan. Looking forward to the next phases. Did anyone have a headache the first few days? I started this diet on feb 1st and have lost 8 pounds. I do not follow the menus, I just follow the rules. The reason it DOES work is that cutting out carbs and eating more protein and veggies causes you to want to eat less, thus lose weight. I agree that the book is a bit overpriced and full of a lot of menus, but I find it works. I was a huge carb and sweet eater, and I have no cravings. I didn’t even go through withdraw. I started the diet Monday and it is now Friday. I was ok until yesterday when I felt very very sick. I am a diabetic and I have to watch my sugar but overall I don’t think this diet is good for me. I did loose 5 pounds already but I can’t stand this feeling of being sick. I am still trying to stick with somewhat to this diet just adding in a carb or two so I don’t feel so bad. Does anyone think this is a bad thing? It was great that you lost 10 lbs in 17 days! Check your calorie consumption and make sure you are not taking in more that you really need with the level of exercise you are doing. I remember 1 post that said she lost 42 lbs in 2 months by holding the calories around or under 1000 and increased the exercise time. Good luck! Hi everyone… I’m looking for some encouragement… I’m on day 8 of Cycle 2, and I’ve been at a standstill with my weight since shortly after starting Cycle 2. I keep hoping to realize a big drop one of these days, but it hasn’t happened yet. I lost 10 lbs. the first 17 days and was so excited. I like the 17 day diet, and it really isn’t drastically different from my normal diet. It has taught me to be more aware of what I’m eating and when. I do encourage people to try consult their physician and try the diet. I’d also like to add that 2 weeks prior to starting the diet I cut out all sweets and bread… I think it made the transition much easier. I just wanted to share my excitement about the 17 day diet. First, YOU HAVE TO BUY THE BOOK that I agree with. It is easy reading and I can’t tell you how many times I have gone back and re-read and referenced and thought about what it said. Second, I am so looking forward to the journey with the rest of you. I am currently in day 4 of phase 1…yes I know not very far along…..but I have already lost 5 pounds!!!!!! I really did not want to get on the scale this morning…..but I just could not stop myself and so glad I did. My husband brought home a big box of the most delicious looking raspberry doughnuts last night and I swear they were calling to me all night long…….I told myself the only way to not eat 2 of them for breakfast was to get on the scale…..and so I did. Well let me tell you 5 pounds in 4 days…….raspberry yummy’s were no temptation to me today. I encourage those of you who are on the fence about purchasing the book to make the investment. Yes the information is common sense stuff that one could glean from a decade or so of research….but why waste your time when someone has already gone to all of the trouble and done it for you? It is less than the cost of three trips to McDonalds and will change your life forever. I can’t wait to continue reading each of your Blogs during this time together and I hope you will look forward to mine. I would not eat these as they are low in calories but very high in sodium. If it is something you cannot live without I would certainly restrict to a couple per day. Good luck! Thank you.Can you eat pickles or pepperoncinis? I would move on to cycle 2 as every other day is the same as cycle 1. If you are watching the portions and exercising x 2 I would keep going. I feel the weight will drop. You will surely see results if you stay focused. Good luck..You can do it! I have a question. Today is day 1 and for dinner it says any of the listed veggies. Carrots are listed but high in carbs and it says no carbs after 2. Is it ok To have them with dinner? Thanks Mike. I’ve been exercising twice a day. I sure don’t want to go to phase 2 because I haven’t lost as much as I would like to. Not too sure about moving to stage 2 even though the book says to. Try increasing exercise and decreasing food portions. This worked for me. Stick with it.. Good luck! Cycle 1 is the same each day for the first 17 days. Then cycle 2 is adding 2 starches ever other day before 2pm for 17 days. Good luck. I have just started cycle 2 and am down 8 pounds. It works! I’ve been on the diet 16 days and have only lost 5 lbs. I am so discouraged. I’ve followed the diet completely. Very, very discouraged. Does the GREEN TEA need to be DECAF or regular? I am on cycle2, day 8. I have been gaining .5 every couple of days. Initially on cycle1 I lost 14 pounds. Any suggestions to why I am not losing? I started this diet on Jan. 1st. I have lost a total of 18 pounds so far. I am absolutely happy with this diet. It is simply a way of life. I do not feet deprived, I have more energy, and I am just happier. I like the easiness of the diet. It’s all about keeping sugar out of your diet and simply having common sense. If you follow this, you WILL lose weight. I have a sister, brother-in-law, mother and daughter that are also doing this diet. Each and every one of them are losing and sticking with it. The body ordors are from the detoxing you are going through – it can last the entire 17 days. Mine was my skin began really breaking out and I have barely had a breakout in my entire 54 years. It is just all those toxins and and garbage leaving your body. It will level out once your are “clean”. Sometimes too much meat and not enough fruit and veggies can do it also – like Atkins – make sure you are eating all the varities of stuff. It is easy to eat the meat to keep you full. Best of luck! Good for you!! You just need to go back and re-read the part about your “fullnes meter”. It will help you determine when you can/should stop eating. Considering your husband’s issues, you need to read the book by Dr. Esselstyn (Dr. Oz is an avid supporter), “Prevent and Reverse Heart Diease” ($9.99 on Amazon). It is shocking and eye opening, but it could turn your husband’s issues completely around before they go too far. I have been stunned by the studies in the book discovering that 2/3 of the world has NO heart diease – it is just us Americans. Going forward I am going to work to change my life completely to a plant-based diet – this way of life is not for sissy’s – it is tough, but there are over 20 years of clinical studies with patients he introduces you to and takes you through their history to date – they would have been dead without him. This is the Dr. that President Clinton saw and has completely turned around his heart and health issues and lost 28 lbs to boot. It’s all about one step at a time and the 17 day diet is the first step for a lot of us. Stick with it. Good luck to the two of you!!! Since 12/20/10 I have lost 29 lbs on this diet (yes, in about a month). It is so easy and filling and you feel amazingly energized. Even though I already knew everything I have read in the book, it was the thing that got me going in the right direction – all I had to do was what he told me – no thinking – no stressing – just follow it to the letter – no brainer. I have started working out everyday with Leslie Samsone’s walk at home tapes. I couldn’t even breath or get through the 1 mile tape and then I was able to do the 2 mile tape and then I could do it twice a day and now I have just purchased her 5 mile and pilates tapes. I have never been able to sick with anything like this. It is like it is the natural balance your body is looking for. I was a serious sugar addict and have had several bags of valentine chocolates around the house for two weeks to give to my kids on 2/14 and have not even touched them, nor had the the desire to touch them – in the past they would have been gone within days. If this can work for me, if can work for almost anyone. Oh yeah, it takes guts or balls or whatever you want to call it to break out of your sorry rut and step up – been there, done that. Woman up!! It’s about committment…to yourself. i would sugest you make some veggy chicken soup so if you feel hungry eat some in between meals. you really need to buy the book!!!!! no you dont have to eat eggs any lean proten in the book is fine. check and see if it has calories or added sugar in it ,if it dose you should not have it. river girl – my whole family is on this diet and no body has experienced any type of oder. I’m not sure why that would happen? I am confused. How many days do I do the first cycle? (accelerate)? Or, do I do cycle 1 for the first day,then cycle 2 on the second day, cycle 3 on the 3rd day? etc..
Or, do I just do cycle 1 for 17 days, then do cycle 2 for the next 17 days? What confuses me is when I read that people on this diet are eating what they want on the weekends! That completely iliminates the direction of only eating cycle 1 for the first 17 days. Please explain. Thanks! Way to go everyone! For those who are struggling with not losing like you want to remember that overall you are making healthy changes to your life and you may not see it on the scale right away but you will FEEL so much better. The first few days are terrible, my husband was like a bear with a sore bum for 2 weeks because he felt so bad. I think this is because the body is addicted to sugar and carbs and it is going through withdrawal. Has anyone noticed changes like bad breath or body odor??? I won’t be fat anymore but I am gonna stink! Mike, it is important that you do not limit your portions too much. If you follow the diet you are in most cases eating 800-1100 calories per day any less and your body may go into starvation mode and will not drop the weight as quickly. I am just finishing cycle 2 and have lost 26lbs my husband has lost 19lbs (only 4lbs from his goal weight) we did not limit our protien portions at all in fact I have been eating much more chicken, turkey and fish per serving than I ever did before. Make sure you are watching your sodium intake as this may also be a reason for slow weight loss…water retention. Hope this helps and stick with it! !